Before I drop the year-end lists later this week, I felt I had to get one more release in under the wire since it'll place highly in top EPs of 2013. 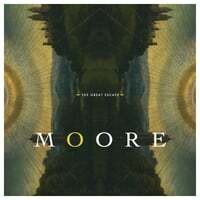 Moore is Aiden Moore, a NYC folk musician who ended up writing some pop songs over the last few years while working on his folk album. If The Great Escape is any indication, Moore might want to concentrate on the poppier side of things. With a sound that's comprised of a mix of Jellyfish, Ben Folds, Coldplay and similar to indie power pop artists like Kevin Martin (of last year's great Throwback Pop EP) and Josh Fix, Moore has cranked out a top-notch piano-pop EP. The title track opens with a bit more synth than piano, but has an infectious chorus which you'll eventually surrender to. But "Table Talk" is the real triumph here - a catchy and clever piano-based number that's one of my top tracks of the year and which would be more than worthy of some of the artists name-dropped earlier in this piece. And the following track, "Celebrity Crush". isn't much of a comedown from "Table Talk", with its own sharp set of hooks. Meanwhile, the bouncy "In Your Head" earns the Jellyfish comparisons, and "Crazy Kinda Cool" maintains the quality with its Blue/Mike Viola vibe. Moore slows it down a few notches on the closing near-ballad "Clicks and Clanks", and while it doesn't reach the giddy highs of the rest of the EP it's still a pretty darn good track. With the likes of Mumford & Sons seemingly turning everyone with an acoustic guitar into a folkie these days, my (admittedly biased) advice for Moore is to zag in the pop direction while everyone's zigging in the folk direction as this is as good a pop debut as I've heard in 2013.